Brush ready-to-use refrigerated pie crusts with butter and cinnamon sugar, and voilà—you've got the yummy pastry wedges for this fruity dessert. Preheat oven to 400°F. Mix 1 Tbsp. sugar and cinnamon. Unfold crust; cut into 12 wedges. Place pastry wedges, 1/2 inch apart, on baking sheet. Brush with melted butter; sprinkle evenly with cinnamon-sugar mixture. Bake 8 to 10 min. or until lightly browned. Drain peaches, reserving 1/2 cup juice. Beat cream cheese and 1/2 cup sugar in large bowl with wire whisk until well blended. Gradually beat in reserved 1/2 cup juice. Gently stir in whipped topping. Spoon into 12 individual dessert dishes. Top with peaches, strawberries and pastry wedges. Enjoy a serving of this rich and indulgent dessert on special occasions. Prepare as directed, substituting 3 cups sliced peeled fresh peaches and 1/2 cup peach nectar for canned peaches and juice. 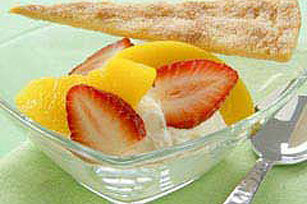 Prepare as directed except spoon cream cheese mixture into shallow serving bowl; top with peaches and strawberries. Arrange pastry wedges in pinwheel fashion on top of dessert.